A 2.5D Cartoon: We take vector art drawings of a cartoon from different views (a) and use them to automatically generate a 2.5D cartoon (b), which associates each stroke with a 3D position. 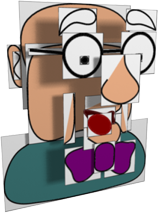 The 2.5D cartoon can then be used to simulate a rotation in 3D and generate a rendering of the cartoon in a novel view (c). We present a way to bring cartoon objects and characters into the third dimension, by giving them the ability to rotate and be viewed from any angle. We show how 2D vector art drawings of a cartoon from different views can be used to generate a novel structure, the 2.5D cartoon model, which can be used to simulate 3D rotations and generate plausible renderings of the cartoon from any view. 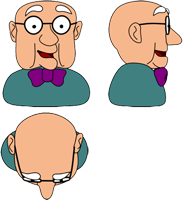 2.5D cartoon models are easier to create than a full 3D model, and retain the 2D nature of hand-drawn vector art, supporting a wide range of stylizations that need not correspond to any real 3D shape. Luis Blackaller contributed much of the artwork used in this paper. Thanks to the reviewers of the MIT pre-deadline and the members of the MIT and University of Tokyo graphics groups. Thanks to Professor Jean-Claude Paul for hosting Alec over the summer. This work was supported by funding from the MathWorks Fellowship. Alec Rivers, Takeo Igarashi, Frédo Durand.